Supermarkets have an enormous influence on the food system — from farm to fork. As the primary place where most Americans purchase food, supermarkets influence what makes it from farms to shelves, what happens to unsold food, and even how much and what types of food shoppers buy. Unfortunately, U.S. grocers focus on donating and recycling food waste, rather than preventing it — and they’re not even tracking food waste throughout their entire operations. Without transparent tracking and reporting of the amount of food waste across their companies, supermarkets can’t be held accountable to customers, investors or themselves regarding their own goals. 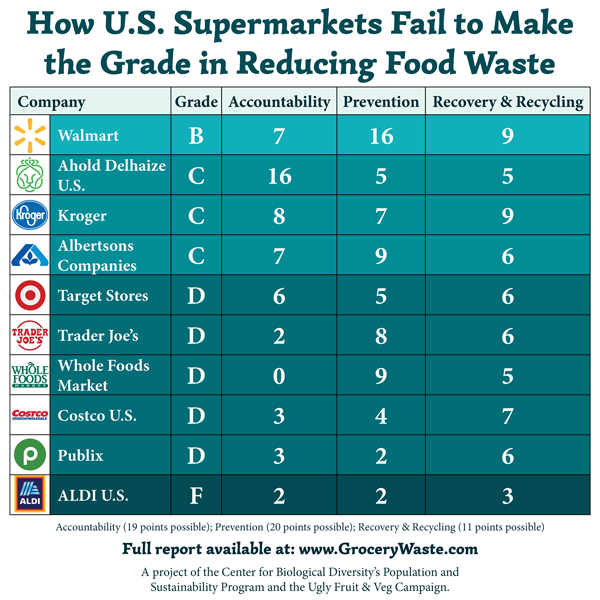 The fundamental first step of corporate transparency — including setting and honoring specific, time-bound commitments to food-waste reduction and public reporting on progress — is virtually nonexistent among U.S. supermarkets. Nine out of America’s 10 largest grocery companies fail to publicly report their total volume of food waste. Ahold Delhaize was the only company that publicly reported its total food-waste volume. Four of the 10 companies have no “imperfect-produce initiatives,” which can prevent the waste of fruits and vegetables considered too “imperfect” for retail sale. Eliminating food waste in the grocery sector could have a ripple effect across society that could help address hunger, save money, conserve water and land, create more efficient agricultural systems, reduce greenhouse gas emissions, and protect endangered species. Customers have taken notice of the massive problem of wasted food in the United States and want responsible businesses to take action. An estimated 40 percent of the food produced in the United States is wasted every year, costing households, businesses and farms about $218 billion annually . Also wasted have been the resources that went into producing that food, including 25 percent of all fresh water consumed, 13 percent of the total carbon emitted in order to produce food, and 80 million acres of farmland used in the United States . Uneaten food is also the single largest source of trash in municipal landfills, attracting wildlife and providing an unnatural and often toxic food source . It’s only by preventing food waste from the start that we can begin to address the environmental footprint and inequalities of our food system. Coleman-Jensen, A., Rabbit, M. P., Gregory, C. A., Singh, A. (2017). Household security in households in the United States 2016. Economic Research Report. (ERR-237) 44 pp. Environmental Protection Agency (2002-d). National Water Quality Inventory: report to Congress. Reporting cycle: findings, rivers and streams, and lakes, ponds and reservoirs.